CAA has a new outreach method. Using virtual reality technology, we’re giving people a more powerful experience of their own compassion. Previously, our essential outreach techniques included leafleting, pay-per-view, and vegan food giveaways. Leafleting and pay-per-view have been effective ways of reaching lots of people and teaching them about the inherent cruelty involved in animal agriculture. The food giveaways give them a taste of the delicious plant-based food options that can replace the animal foods in their diets. The technology is made available through Animal Equality’s iAnimal project. At CAA outreach events, our volunteers invite passersby to participate in the virtual reality experience. Once they agree, they get to wear some special headgear, sort of a high-tech combination of headphones and goggles. 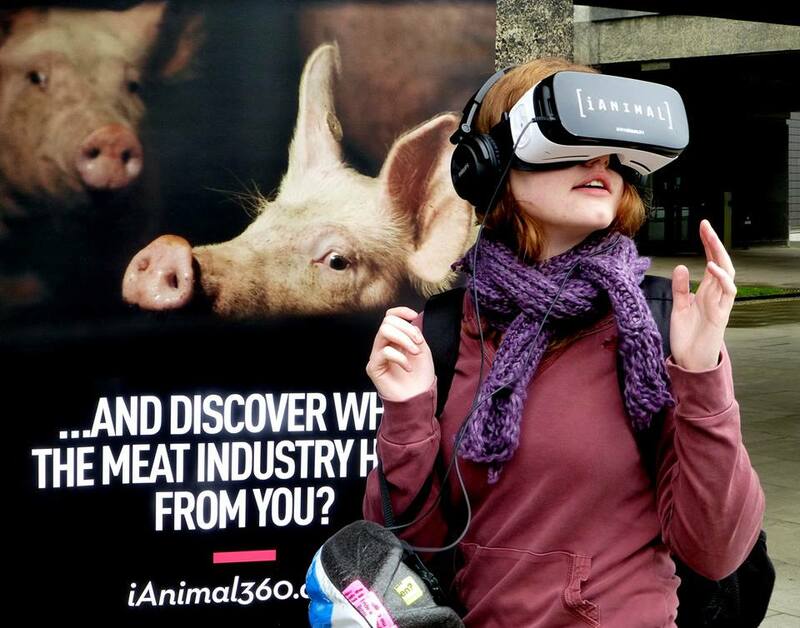 With both audio and video, the participants have a totally immersive experience, with a 360-degree view of a factory farm from a pig’s perspective. To watch a poor sow, locked in a cage, unable to move or turn around, in a facility housing many others… a breeding facility. Lying in her own waste, unable to enjoy contact with her piglets other than by suckling them is both harrowing and heartbreaking. The experience places you in the facility, it is unforgettable. You can view the video here and move your cursor to the get a sense of what the participants will experience when they move around to get the 360-degree view. Our first virtual reality outreach event will be at the University of Minnesota on Tuesday, April 18. 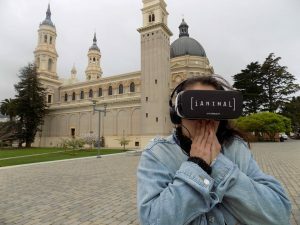 If you’re interested in facilitating the virtual reality experience for future outreach events, come to our volunteer orientation meeting on April 26 and contact Laura Matanah at laura@exploreveg.org. You’ll get trained to use the equipment and coached on how to engage the public and advocate for the animals in the most compassionate way.